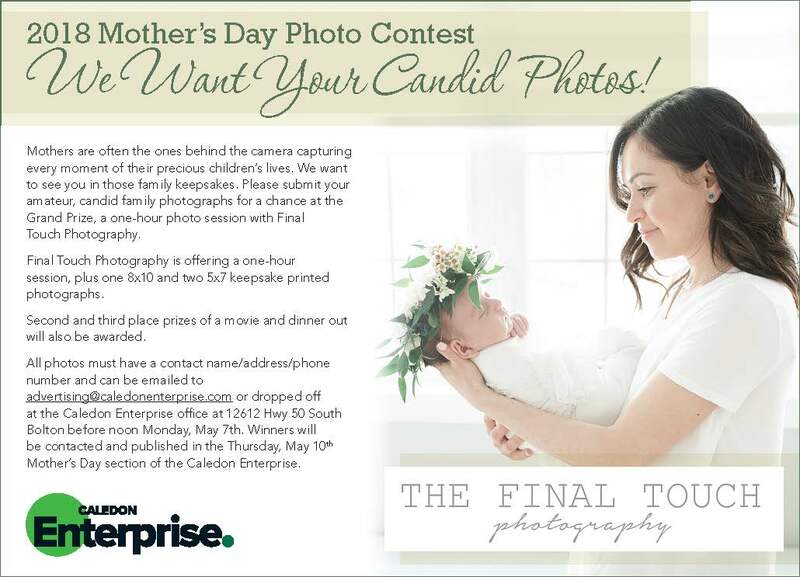 I have to say I was over the moon when I was asked to be part of the Caledon Enterprise Mothers day contest. How could I say no!! I love and miss taking photos of moms and the kiddos. I'm getting excited also to be getting back to work in a couple of months. I have been planning what will be up and coming for The Final Touch Photography for 2018. I do have tons of new ideas, goals and plans for the future. I do have many people asking about Get out of Auto for moms too. If you are interested please contact me here. I will have a new class in the summer for all those moms that want to learn how to use their DSLR. Ok back to the exciting Mothers day Contest. Here is the beautiful image with all the information on it. I do know there were some questions I saw on Facebook about the details and I will post them below. Can I enter more than 1 photo? No more than two please for consideration. Is it a mom and baby photo or just baby? Candid photo submissions can be family photos, mom and baby etc. Can it be a selfie style photo? Yes! Last note, I never know what to post next. Looking at this photo makes me want to post this gorgeous and beautiful newborn session that we used for the image above. Oh how much I love taking photos of this family. Stay tune to check the next post.